Count on our amazing awning store and first-rate installation service from LWP Home Products. Over the decades we’ve made our name one successful awning at a time and we appreciate your business. When you need dependable shade over a window or your front door, awnings are both convenient to stay out of the sun or rain, plus they add to your home’s curb appeal and value. At our awning store you can choose among several weather-resistant materials such as aluminum, polycarbonate, and high-performance fabric. Prepare to be dazzled by hundreds of solid and stripe selections to complement your home’s colors. Our colorfast fabric has been specially treated to resist years of the sun’s rays as well as rain. No fading: your awning will remain looking new! Also, our awning store’s selections are fully customizable. Got a challenging space to cover? No problem. Only need shade some of the time? Look into our retractable fabric awnings engineered with the finest components from Germany! Our team can also make a large awning for a wonderful carport. Always wanted a screened-in porch? We’ll make it happen, covering it with the finest of awnings, and you’ll LOVE the result. When it comes to awning installation, you don’t want to leave things to chance. You DON’T have to struggle with this task over a weekend and risk damaging your new purchase! When you ask LWP’s seasoned professionals to do the job, you can rest assured that your custom shade solution, be it for your driveway, patio, or front door, will be perfect, fitting your space beautifully and with no chipping or peeling. 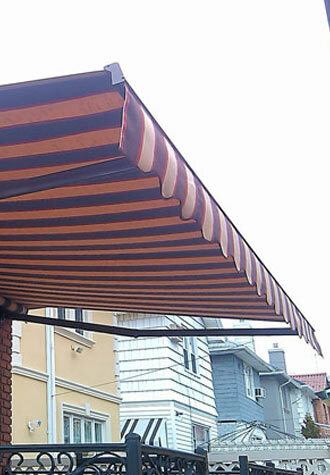 Your state-of-the-art new awning will be in the finest hands in the five boroughs. We are licensed contractors holding NYC license #674635 and rated A+ by both Angie’s List and the Better Business Bureau. 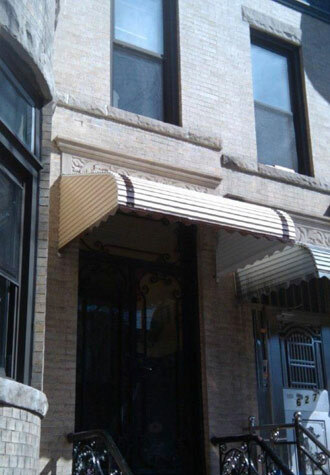 Our Brooklyn, NY awning store is your surest option for an affordable, durable, and attractive solution when it’s time to choose and install only the finest. Stop by for a consultation.